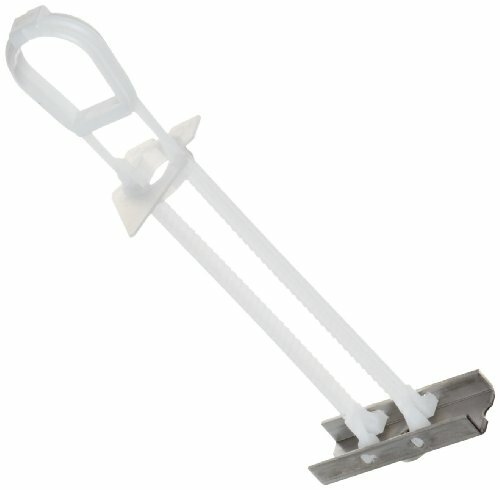 The TOGGLER SNAPTOGGLE BC toggle anchor provides a secure hold from within various hollow materials 3/8" to 2-1/2" thick including gypsum board, drywall, and concrete block, and is made in USA. The anchor requires a 3/8"-16 UNC-threaded metal bolt with a minimum length equal to the thickness of the item being fastened and the thickness of the mounting material plus 1/2". The anchor channel will not rotate when installing the bolt, whether installing by hand or with a screw gun, and will stay in place if the bolt is removed to facilitate fixture and screw changes. The SNAPTOGGLE anchor meets Federal Specification FF-B-588-D for Type V anchors. 1/2" Drywall 3/4" 3/8"-16 UNC zinc-plated steel 275 lb. 292 lb. 5/8" Drywall 3/4" 3/8"-16 UNC zinc-plated steel 576 lb. 406 lb.